Alright, so you know what home staging means and have a bit of an idea of what it looks like. But you are still skeptical. After all, wouldn’t most people want to see what a lived-in house really looks like? Or at least understand that real people live there and that it isn’t a museum? Can’t people see past a collection of butterfly magnets on the fridge and just see the fridge that comes with the house? Recent data on home staging shows that nine out of ten people can’t see past what is in front of them, whether it is a collection of fishing trophies in the living room or a completely empty space. People seem to have a hard time separating what is there from what they will bring when they move in. The truth is, they likely don’t even want to see what it will look like with their furniture in it, what your potential buyers really want is to know that their new home can be made to look like the beautiful set pieces one can see on HGTV. Is it fair? Perhaps not, but it is the world we live in. It does not need to cost a lot of money and will almost certainly result in getting your money back many times over. While it is impossible to predict specifics, recent data from the National Association of Realtors (NAR) and the Real Estate Staging Association (RESA) show that staging your home is both likely to sell it faster and will also bring you a higher price than if you do not stage. Let’s look at some of the data. Anecdotal evidence and smaller surveys had been suggesting for years that staging was a sure-fire way to set your home apart from the pack. However, it was not until January of 2015 that NAR had published a report that provided hard, reliable facts on the growing trend and its effect on home sales. In that report it was revealed that 49% of agents witness their buyers being affected by staging in almost every instance, with 47% reporting that at least some buyers have been affected. This means that removing the clutter and putting on a fresh coat of paint before your agent even begins taking pictures for the listing will almost certainly result in more people being willing to stop looking at your house from Zillow and set up an appointment to view it from the inside out. In fact, a large portion of agents reported in the study that their buyers were more likely to walk through a home if they first viewed it online. Assuming of course that the photos represented a clean, modern and appealing home. Another positive effect of staging is that buyers are more likely to overlook faults in the property. This was reported by 28% of agents, meaning that a tastefully staged home can lead to a buyer overlooking things like a small back yard, or the lack of the skylight they were really hoping for. Even more important is the amount of time spent on the market. According to RESA, a home staged prior to being listed will sell in an average of 42 days. A home that is listed without being staged can spend as much as six months on the market. For anyone who has ever tried to sell a home, any time that can be saved in this stressful process (some say that it is more stressful than divorce) is precious time indeed. Ah, but what about the money? Just how much can going through the effort of staging really gain a seller? 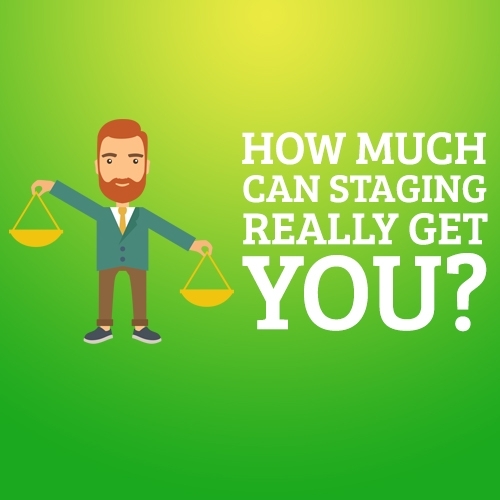 The responses vary, but according to NAR, a majority of realtors say that staging yields higher selling prices, ranging from 1% of the value of the home, all the way up 20%. On average, for an investment of 1-3% of the home’s value, a seller can expect a return on investment (ROI) of 8-10%. Then there is the fact of the faster sale. As stated above, if you are able to sell your home in a mere six weeks instead of six months, that is likely thousands of dollars in mortgage money that does not have to be wasted on a house you may no longer think of as a home. Even if you happen to live in an area that is currently enjoying a seller’s market, staging is still imperative. Making your home more appealing is the factor that can positively affect the would-be buyers and possibly lead to a bidding war between them. And that means a higher selling price. Again, it also would make a quick sale even more likely. The facts are clear, staging your home prior to listing it is almost certain to not only bring you a higher price but to get you out of your old house into a new dream home in as little time as possible, making staging a more than worthwhile investment. Where and how much to spend? The answer of course, will vary depending on your market and how much work your particular home may need. To get an idea of what sort of things you should focus on in your own market, work with your agent and if possible, a professional stager. All of that said, the NAR report states that the average a seller spends on staging is $675. While not a small sum, it is one that many will be able to afford. However, where to focus and how much money to spend on any area are questions that still need answering. Internal Staging – Staging the inside of a home can be very expensive if you are going for that finished, model home look and need to build it from scratch. However, it can be quite cheap if you think creatively. The key is to focus your time and energy on where it will be the most effective. The living room is one of the most effective areas to stage. It can cost as little as a $30 can of paint and a few fresh plants to give your room a whole new look. This is particularly important. How easily a buyer is able to see themselves in the home’s main gathering space is sure to affect that return on investment we discussed earlier. Kitchens and bathrooms selling homes is a maxim that has been repeated over and over again. The NAR study shows that this is very true. As before, this need not be expensive. Nearly any surface can be painted, as long as you find the right kind of paint to stick to the surface you are trying freshen up. Other improvements like new towels and new hardware for the cabinets are simple to do, and combined should not take more a $100. A simple thing you can do anywhere in the house is to improve the lighting throughout the home. Again, you do not need to spend a lot of money here. There is no need to go for the expensive LED bulbs, just focus on making sure the highlights of your home are sufficiently well-lit so that it will create a warm atmosphere. $20 dollars of new incandescent bulbs will go a long way to giving your home a cheap makeover. Curb Appeal – Curb appeal represents the first impression your buyer will have as he comes up the driveway. You should plan on spending at least a hundred dollars here. Look into painting your doors and trimming your yard, getting some new plants or even something like a decorative fountain. Creating a positive first impression, will have a big impact on how your buyers will view the rest of your home and will be sure to affect the price in a positive way as well. Neutralization/depersonalization – This largely falls under the heading of internal staging but as the most important part of the whole process it deserves a separate mention. You no doubt have heard of de-cluttering. That’s what this is, but focus on the items that are uniquely yours. As you can imagine, it does not cost much. If you do not have an out of the way place in your home to store boxes, your only cost will be the use of a storage unit that can run $50-$100 a month. Keep in mind, if your home is staged properly, then you should not need to worry about the expenditure for more than a month or two. The benefit here is that it preps the home in such a way that your mark is minimized as much as possible, allowing the buyer to visualize themselves in the home. In fact, 81% of agents report that staging accomplishes exactly that, and the easier a buyer can see themselves in your home. Furniture – Furniture placement in itself does not cost much, especially if you are able to move items around the house. However, you may need to replace or remove items that are too badly damaged. You could buy new, but a better solution may be to rent furniture for the time that your home is on the market. While it is true that this can run in the hundreds of dollars, this step can more than pay for itself. Remember, an investment of 1-3% of home value leads to an 8-10% ROI.